There will be a lot of news today regarding the development of Heathow Airport's third runway, but buried in the detail is a proposal to build a new railway station on the Great Western Main Line, conceptually called Heathrow Hub ( but I suspect that Heathrow Parkway my be its eventual name), which would be linked directly to the various Heathrow terminals by a local metro system. This would be immediately benefical to Welsh rail travellers (or at least those in the South) by providing a more direct link to Heathrow. But the real benefit comes later, as this is part of a much more ambitious scheme to develop a high speed network. Phase 2 of the plan would see a high speed tunnel linking the new Heathrow station with the exisiting High Speed line at St Pancras, with direct through trains to Paris and Brussels. This means that Welsh travellers can travel from Cardiff to Paris with one cross platform change at Heathrow. A huge improvement on the current cross London transfer. Phase 3 of the scheme would see the new high speed line extended north, so it should be possible for travellers from North Wales to go to Paris with just a platform change at Crewe, as well as benefitting from the higher speeds going south. While not yet officially part of the shceme, it has already been mooted that the GWML could be relatively easily upgraded to High Speed standards, at least as far as Bristol Parkway, but a more significant investment would be needed to extend to Cardiff, and then we could see through trains from Wales to France. Now while all of these schemes are in England, they would have a huge impact on Wales, and the Welsh economy in general, and need to be followed from a Welsh perspective. That's a good point, Penddu. Wales could benefit from a Heathrow Hub. These are some diagrammatic maps that I've googled. I'm not sure that calling it Heathrow Parkway will work, Penddu. Any association with the humdrum Bristol Parkway should be avoided at all costs. Heathrow Hub has got a nice ring to it, but Heathrow International has got to be odds-on favourite. When I heard "Heathrow Hub" my mind went to a completely different version of it, namely a huge circular underground cavern in which four different railways were to cross at different levels. I found this picture, and you can click it for the website. Needless to say, although I could admire the grandeur of that concept, it would be hideously expensive. The Arup proposal is, even at first glance, something much more buildable and in fact a very good idea. As for the new runway and Terminal 6 at Heathrow, I am disturbed by it. So I'd want to say at the outset that that the two issues need not be linked. We can and should press ahead with the Arup hub and High Speed rail link whether or not the additional runway goes ahead. But if the political (or indeed economic) reality is that the only way to get the rail is to also say yes to Heathrow expansion, then I would reluctantly say yes to both rather than have to lose the rail link. It took many years to build HS1 from the Chunnel to London, and by far the hardest part of extending a High Speed line beyond London will be to pick a route to get it past the outer suburbs. Most of the HS1 line into London was underground, and my guess would be that the same would have to be done on the other side, hence the £4.5bn price tag. Does anyone have any further details? If we can build a political consensus that Heathrow should be the next stop on the High Speed network, and that after Heathrow it veers towards Birmingham and then on towards Manchester, we have the start we need and the old proverb will prove true: Deuparth gwaith ei ddechrau. Also, mostly because I like posting videos, here is a clip from the BBC with comments by Rhodri Morgan and Martin Evans of the Wales Transport Research Centre, University of Glamorgan. Some time ago, on the Wales Online forum, I outlined my plan for a new High Speed Rail Link from South Wales to London, connecting to the existing HS1 that runs between London St Pancras and the Chunnel. My preferred route for a South Wales link is Swansea, Cardiff, Newport, Chepstow, a new Severn crossing at Sharpness (combined with road, there have long been local calls for such a crossing to Lydney - it's also where the old Severn rail bridge was, so it's a straightforward crossing), Gloucester, Oxford, High Wycombe, London St Pancras, and on to the continent. Cardiff to London would be brand new, about 225km/140miles, and cost less than £3bn. The big cost items would be the bridge (the second Severn crossing was £300m) and a Chiltern tunnel. There are already good routes into St Pancras. Target speed 320kph/200mph. Continental loading gauge. I particularly like this alignment because it covers some weak spots in the English railway network, and would go part way to providing a southern link from London to Birmingham. Or alternatively link into a new north south route roughly along the same line as the old Great Central Railway. This story should show that my figures are about right, even though it refers to a more southerly route and therefore a more expensive new Severn tunnel. I don't see much point in almost exactly duplicating the current Paddington main line. The route I suggested does several good things. The present rail journey is about an hour. About half the journeys involve a change at Didcot. The GWR line is vastly overstretched at the London end. There is no spare capacity. Following the Ladbroke Grove rail crash huge numbers switched from rail to road (the M40). As well as private cars, there are several coach operators that run a frequent commuter service, some operating a double decker coach every 12 min. The advertised journey time is 100 min, a good part of which is negotiating London traffic. This high speed line would cut the 50 mile journey down to about 25 min. It's a no-brainer. Gloucester and Cheltenham have a joint population of over 200,000. To get to London by train is a two hour journey. There are [virtually] no direct trains. Gloucester is about 95 miles from London, so the journey time would be less than the psychological hour. This would bring C&G within commuting range of London. It would also fill the biggest "hole" in the railway network in that area. It's about 25 miles from the old [M48] Severn bridge to Gloucester. Combining a roadway with the high speed rail crossing would be of immense benefit to that area, and would also ease road traffic congestion in Gloucester itself. All these things are of benefit to England ... but they will also be of immense benefit to Wales. A win-win situation. Joined up thinking. As for existing freight from Rosslare, none of it can be carried west of Swansea by rail because the track is too fragile to take it. 24% is pure delusion. Virtually everything is carried by HGV. If we improve rail, there is no need for doubling up the M4. The proposed Gwent Levels stretch is 15 miles of motorway at £400m, over £25m a mile. But, to finish, think of this journey. Fastest Cardiff to London journey about 75min, compared with 2 hours now - a 45min improvement. Perhaps a more typical journey would be Cardiff-Newport-Gloucester-Oxford-London at say 90min. We might even get a few direct trains to Brussels. Cardiff-London-Lille-Brussels in less than three-and-a-half hours sounds good to me. Above is a diagrammatic layout of their proposal. As you can see, the critical difference between the Arup and Greengauge schemes is that the Heathrow Hub is on the main route in the Arup scheme, but a spur off the main route in the Greengauge scheme. The Greenguage route is in green, essentially following the M40 corridor out of London. In black is the existing GWR line to Paddington. The cross is where the Heathrow Hub will be. I haven't shown the Arup route from St Pancras to Heathrow, but I guess much of it would follow the existing GWR route, because the route is quite wide in places and this would minimize the need for tunneling. The Eurostar depot is also on this route, at North Pole Junction. The next "certainty" on the route north is that HS2 will pass to the east of Birmingham ... and very probably through a station at the NEC and Birmingham International Airport. Obviously the exact route will be subject to a lot of debate and negotiation, but I believe it would be best for it to pick up Oxford, which is the major population centre. 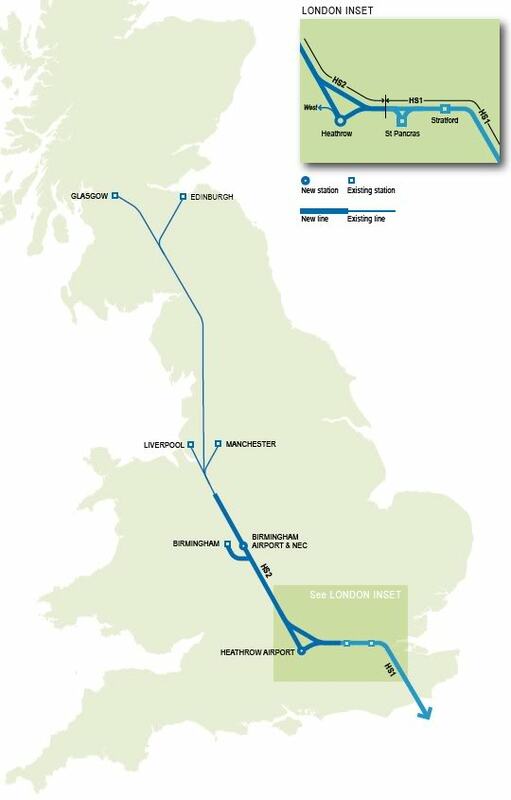 So the blue route represents the path I would like to see HS2 take from Heathrow Hub to Birmingham NEC. We "sell" the route to Oxford on the basis that it gives them a much better commuter route into London, as I mentioned before. But, as you can see, if we now build HS3 along the red line we pick up the Cheltenham/Gloucester conurbation, also provide a new crossing over the Severn close to Lydney and Sharpness, and then come down into Newport and on Cardiff. Again, we "sell" the route on the basis of vastly improved travel times from C&G to London (putting them within easy commuting distance to London for the first time) and the new Severn Bridge will also carry road traffic, which is what the locals have been campaigning for for years. But for us in Wales (well the south, at least) the beauty of the plan is that we get nearly half of our High Speed route for free. HS3 is now only 120km instead of 220km. Now, in practical and political terms, we know that the UK government is going to put a higher priority on building HS2 to Birmingham and Manchester ... and perhaps then on to Scotland. So if we want to see HS3 come to Wales, it is us in Wales who have got to take the initiative. To put it bluntly, we have to pay for it ourselves. If we use Professor Cole's figures, the line from south Wales to London would cost about £3.5bn. We know that the biggest chunk of that cost would be getting out of London. So I'd hazard a guess that the line from south Wales to Oxford would be around £2bn, maybe £2.5bn now. That is not unaffordable. For example the Scottish government is looking to spend some £2bn on a new Forth Bridge. The difference is that nearly all of the line we want to pay for is in England, but there should be nothing to stop us using a variation on the PFI type system so loved by both Labour and the Tories in London. Essentially we, Wales (through a separate body wholly established by the Welsh Government) would act as the PFI consortium. We would build the line and operate it for, say, the standard 25 years, making a profit from the fast commuter trains that would use it. We would also charge tolls (which may well be invisible, such as on the A55) for road traffic using the new Severn bridge. This is only an outline, and I know there will be people with a better grasp of finance who can put firmer flesh on these bones. But in principle doing something like this will mean that HS3 can be built at the same time as HS2 works its way northwards. It is only necessary for the UK government to commit to building the section from Heathrow to Birmingham. It looks like you've been busy, MH. I like what you've proposed, but I'm not sure the government will want it to go via Oxford. What if they pick a route closer to the green line on your map? But a good addition would be to complete missing leg of the "triangle" with a line from Birmingham to Bristol. Also, do you think there's room for two completely separate lines to South Wales? Wouldn't it be better just to improve the existing line and electrify it? Finally, don't you think its a bit weird for Wales to pay for a line that will benefit England? Surely the UK government has to build things in England, and all we can do is lobby hard for them to spend the money. Thanks AV. Yes, I would agree that a line from Birmingham NEC to G&C would be a perfect future phase. It could share the track between G&C and the new Severn Bridge, then extend on down to Bristol and further into SW England. Going the other way, it gives us a fast route from South Wales to the Midlands, Northern England and Scotland. Any route is a compromise between straightness and practicality. Whether Oxford is on the route of HS2 or not will be a decision for those who build HS2. They might well decide to go from Heathrow Hub to Birmingham on the green route. If so, the red HS3 will need to be about 30km longer, but would go through Oxford. Oxford will gain good links to Heathrow, London and Europe. If we build is as part of HS3 rather than HS2, HS3 will make money from the Oxford commuter traffic into London. As for the existing GWR line to Bristol, it is certainly not in my mind to abandon it. It is a good line, but it does have limited capacity. I'm all in favour of electrification (for all main lines) but I don't think speeds or capacity will improve all that much. Much will depend on signalling improvements. The Severn Tunnel is a weak link. It is old, a lot of water has to be pumped out of it constantly, and it closes one day a week for maintenance. It is still useful, but it can't be our only link. If we want to make a radical shift from road to rail, we will need more capacity. One thing we must do is to get long distance freight, particularly from Ireland to Europe, off roads and onto rail. Turning now to how we pay for HS3, I will admit that the practicalities of plotting the route (and of course its cost) have been my prime concern, but that others with better finance skills will know far more about how to set up a funding mechanism. My point is that if we wait for the UK government to build a line to us, we will not be first in the queue. So we need to be prepared to spend our own money if we want it any time soon. At present Wales' money comes in the form of a block grant from the Treasury (plus Barnett incrementals). We get roughly £15bn a year. If we were to gain borrowing powers we could almost certainly finance £2bn or £3bn against that. However the tricky thing is that we would be spending money which will not only benefit us in Wales, but will also benefit those parts of England through which the line passes. Places like Oxford and C&G are no real position to make a contribution, therefore Wales needs another way of getting a return on our investment. As the UK government is ideologically attached to the PFI model, there is no reason why we can't act as a PFI constortium, so that profits from allowing services to run on the new line come back to us. Hello MH long time no hear. This is my first post on this forum. I can understand the idea of a third runway even though I have my reservations about it. London is trying to compete with other major European hubs such as Paris, Amsterdam & Frankfurt. There are many disadvantages of London having more than one airport. For example if you travel from New York to Athens connecting in London, by arriving in Gatwick but departing from Heathrow, the connection can be a major hassle. You would have to go through UK customs & immigration control (just for the sake of being in the UK a few hours), recollect your luggage, find some ground transportation to Heathrow, ensuring you make your check in deadline. But if you went via Amsterdam Schipol or Frankfurt, the connection is far more simpler. You don't have to go through Dutch/German passport control, and your luggage is checked through. Therefore as a competitive international hub it is in the interests of London having one major hub airport instead of two. Since the openskies agreement British Airways, Virgin Atlantic, American Airlines, US Airways etc are slowly pulling out of Gatwick for Heathrow. I'm a frequent traveller to the states and when I compare Heathrow & Gatwick to the likes of Schipol, JFK, O'Hare, DFW etc I think they are an embarressment to Britain. Overcrowded, congested & dirty. I was interested in Boris Johnson's idea of a man made island super airport off the coast of Kent & was a shame that the government didn't consider that idea. I can understand this would be more inconvient for Welsh travellers who would have to travel to the other side of London to fly, but would no doubt increase demand for regional airports west of London, such as Bristol and Cardiff. More international connections at Cardiff Airport would help the Welsh tourist industry. Wales as a nation needs to promote itself internationally like Scotland & Ireland do, but cannot do that with the lack of services that Cardiff currently offers. The Heathrow Hub doesn't sound like a bad idea, though. I would add that the rail link should be 'airside' service, interlining with the major airlines operating at the airport. In other words you would check in & go through security at your boarding station, so upon arrival at Heathrow all you would need to do is go directly to your boarding gate. Understandably this would be more costly & therefore the railink would probably only stop at major cities such as Reading, Bristol, Cardiff, Birmingham, Liverpool, Manchester, Glasgow, Edinburgh etc. I believe SNCF in France & Amtrak in the USA offer interlining services with major airlines. One of the things that gives me some hope that Obama really will make a difference is the latest news about a major high speed rail investment programme. What might we learn? That it would be good for the UK to make a similar provision in its bailout packages ... which seem to be disproportionately aimed at banks rather than doing something which will be of long term benefit to the economy. With construction tendering costs at rock bottom, there is no better time to be planning such things in the UK.